Milford Sound is unbelievably beautiful! It is one of the many 'Sounds' sat on the South West coast but has actually been named in error. 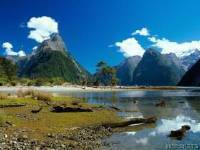 The early european explorers named it a 'Sound' as that is what is referred to a valley formed through flowing water, however Milford was carved through a huge glacier during the ice ages and should therefore be called Milford Fiord. It is the most spectacular of all the 'Fiords' on the West Coast with Mitre Peak being the tallest and most fascinating mountain. I arrived there on Monday 27th and spent the night on the Milford Wanderer which is a small cruise boat with about 25 other tourists from around the world. That evening we sailed down the Fiord and marvelled at the immensity of the place. Until you see this place in real life you haven't seen mountains (and I live in the Lake District)! During the cruise we were followed by several 'Bottle Nosed Dolphins' and also saw a few Yellow Crested Penguins which are the second most rarest in the world. Now I'm not a naturist at heart but you couldn't help but be fascinated at the environment and the wildlife the place boasts. What made it better was the fine weather we had that evening! We had a meal on board around 7.30pm and after that the crew brought out the board games and I ended up playing 'Fact or Crap' with an English couple called Andrew and Kate, Elaine from Hawaii and Dave and Christina from Germany. Sounds boring I know but what a scream we had! It was then Jenga and bed at 11pm. I was lucky enough to have my own cabin and that was me out for the count until 7am when a fry up was served (yummy!). Outside it was absolutely chucking it down with rain and there were low clouds and mist turning the whole place into a very eerie atmosphere. The good thing about this though is that we got to see the many waterfalls at their best. I wouldn't be exaggerasting if I said there was approximately 1000 300ft waterfalls to gaze at in Fiord! We got back around 9.30am and it was time to get the bus back to Queenstown.